The first BAX event of 2017, on 13 March, held jointly with Chatham House, in St James, London, saw a full house. The meeting was chaired by Dr Claire Spencer, Chatham House, and BAX Trustee, who said that despite negative news headlines, when one looked at the human, cultural and education changes, there was some good news coming out of the Middle East. Much of this is the result of civil society initiatives, and it is laying the groundwork for future developments. Martin Rose, chair of the BAX Trustees, explained BAX work of organising exchanges between Europeans and people from the Middle East. BAX ‘alumni’ have commented that “There is no substitute for personal knowledge and friendship for building bridges”. “Education in situations of conflict is as fundamental a need as shelter, food, and health”, said Catherine Roe, of the Said Foundation. “In Syria, we found that what counts for parents and grandparents is seeing their children going to school, as education gives hope for the present as well as the future”. Brita Fernandez Schmidt, Women to Women International, emphasised the importance of investing in women and teaching them skills”. Women to Women has seen how this gives them confidence, as 13% of women they have trained had eventually run for political office. “Perhaps the most important element is to create connections between women round the world”, she said. “The Arab World has so much potential”, said Omar Al-Qattan, of the AM Qattan Foundation. “We run a cultural centre in the Gaza Strip, but without a political project (to solve the Palestinian-Israeli conflict) it won’t last. It’s time to revisit the idea of foreign aid and diplomacy, otherwise humanitarian gestures are no better than a Band-Aid”. During the question and answer session, which followed, speakers were asked about the need for civil society in the alternative peace talks in Syria, and about the fate and role of refugees. Speakers were critical of Western governments’ policy on the Middle East, saying there are better ways of making progress, than simply concentrating on eliminating ISIS. Instead governments should put more resources into the young men and women in the region; working on an individual level can bring about changes. Speakers criticised the lack of coherence in the British government’s policies on aid and diplomacy. It appears that the government is concentrating on selling arms and IT to Middle Eastern governments, when it could be using these as a tool for affecting change in their policies. The event was followed by a lively reception. 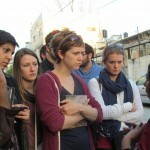 A privileged exchange group from the UK learn about life in the Palestinian Territories. Apply before 8 April 2013 to enjoy this exciting volunteer role with us. PLEASE NOTE THAT THE APPLICATION DEADLINE FOR THIS ROLE HAS NOW PASSED. We were delighted to celebrate British and Arab musical talents in London on 13 February 2013. Read this article by Sandra Lawson. Issue 1 Spring 2012: We hope you enjoy reading our first newsletter. Do you have an experience of your own British-Arab exchange that you would like to share with other BAX supporters? 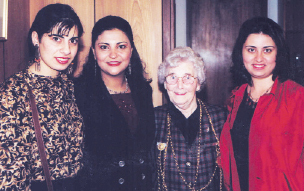 Students of Bethlehem University with the Lord Mayor of Newcastle-upon-Tyne, 1997.